When it comes to first class, Lufthansa continues to raise the bar. A few years ago, Germany’s national airline set the standards for ground handling when it unveiled a first class terminal at its Frankfurt hub. Now Lufthansa is poised to set the standards aloft by introducing a new concept on 10 of its fleet of B747-400s. These aircraft ply some of Lufthansa’s most important business routes. It’s a concept whereby first class passengers are provided with not just a seat. Instead they are offered both a seat and a bed. Let me explain. Right now first class passengers booked on the B747-400’s upper deck (the zone used by Lufthansa to locate its first class cabin) are offered nothing special by current standards. Whereas rival carriers like Emirates and SIA provide suite accommodation for their top customers on many routes, passengers with Lufthansa do not enjoy the same level of privacy. But all this is about to change with the news that Lufthansa will totally revamp its existing fleet of B747-400s by November. Although there will be no significant changes to business and economy classes the revamp will provide a quieter, more spacious and more exclusive atmosphere in first class. In a statement, Lufthansa says it is entering new territory with its first class seating concept. The window seats will be converted into full-length, lie-flat beds with a sleeping surface (over two metres in length) and a top quality mattress which the airline claims will guarantee seat comfort. “Each passenger in the new first class cabin will thus not only have a seat but also a separate bed. Sound-absorbing curtains and sound-deadening insulation beneath the carpet will ensure that passengers enjoy the necessary peace and quiet,” claims Lufthansa. What it means is the number of seats on the B747-400’s upper deck will be reduced from 16 to only eight. Seating will be configured just 1-1 with the bed positioned alongside the window for added privacy. The seat, which from the pictures appears similar to an older version of a first class seat, adjoins the aisle which makes it easier for meal service. It also means it would be possible to converse with your neighbour across the aisle should you so desire.Lufthansa is set to take delivery of a new fleet of B747-800s by early 2012. The new first class product is almost certain to appear on these planes along with fully-flat beds in business class (see online news October 6, 2010). The new B747-400 first class seating will appear starting next month with installation to be completed by November of this year. Details of the first routes to see the fleet of 10 revamped B747-400s have yet to be announced. Neither is it clear whether first class fares will rise to pay for these improvements. 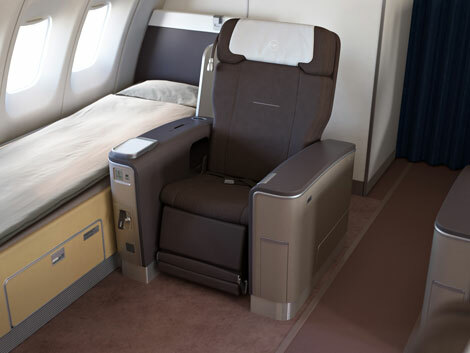 Lufthansa is a global airline so first class passengers around the world whether flying north-south or east-west will be able to sample the new seating. For more information, visit lufthansa.com.